After our dud of an adventure on Friday.. Saturday had to prove to be better. It was our last day in MD before heading to Colonial Williamsburg for a few days and it was adopt a dog day! We woke up slowly that morning and since we only had the 2nd part of the 3rd LOTR movie to watch, we watched it. About halfway through, I started getting antsy and since I knew we were planning on heading to DC/Annapolis after picking out a dog, I wanted to make lunch so that way we didn't have to stop and pick something up on the way. After I put the roll ups in the oven, I took a shower while Drew finished the end of the movie and removed the roll ups when they were finished. We were set to be at Greyhound Central (GHC) at noon for the adoption process and the sooner we got there, the better choice we had of the dogs. We made it by noon, which kinda surprised me since we were still getting ready at 1125. When we got to GHC, there was a beautiful black greyhound outside being tested to see if she was small dog friendly. Turns out, she wasn't, which immediately eliminated her from my options (which made me sad, because she was really pretty). Since Courk has small dogs, and I always bring my pets home with me to visit, the new dog has to be able to get along with Judge and Noodles (Courk's spoiled beasties). They also had to be kid friendly. My requirements were BIG.. and preferably not white. It is said that rescue dogs choose YOU. I could probably attest to that. Drew and I went inside to check out the other dogs that were available for adoption. I said I wanted a big, small dog friendly, kid friendly pup. They showed us Pals Spotlight first. He was 75 lbs and small dog friendly and most likely kid friendly and mostly white with 2 brindle spots. We took him out to walk around the yard, in the freezing cold! First thing he did was release a Phil-size pee, which practically drowned the poor bush he attacked. He walked with me for a bit, then I handed him off to Drew to walked him around for a few minutes. When Drew stopped walking, the dog leaned on Drew for pettins. Other dogs were coming out and I wanted to make sure that we got to hang out with each available dog so that way we wouldn't miss out on the "right" dog. We took Spotlight back inside and brought out his "twin" Storm. Storm was smaller, but he was also white with brindle spots. Drew and I walked Storm around and we just weren't feelin' it. There was a brindle female that had been brought out named Jasmeen and I had wanted to see her and I instantly got worried that someone was going to claim her before we could even take her on a walk. I knew that she had some issues that required surgery after her spading procedure but she had recovered. We traded a man Storm's leash for Jasmeen's leash. He was reluctant to let her go, but he went through with the trade. Drew and I walked Jasmeen around, she wasn't really interested in either of us. She didn't even want pettins from us. We saw Spotlight being walked by someone else and we offered to trade Jasmeen for Spotlight (because I was really worried that guy was going to decide on him). Spotlight was the largest dog they had at this adoptathon, which for me made him stick out. We gave Spotlight a little more attention then we decided it was time to go in cause it was cold. When we got back in we looked at the other dogs in the crates, some of which had already been adopted, some hadn't. The GEGR volunteers asked us if we'd found the dog we'd like to take home that day and we just looked at each other. I asked Drew then, "It's Spotlight isn't it?" He said, "Yeah." We told the lady that we'd decided on Spotlight and they changed his name plate to say "ADOPTED!" After that everything was kind of a blur. As I was standing back just taking everything in, no one was listening to my requests or questions, which was semi-concerning. Honestly, I felt like maybe there were just too many volunteers. Many indians and not enough chiefs? Drew and I discussed it after the fact and that's what we'd come up with. We waited to fill out paperwork for over 20 minutes. I picked out a coat for the new pup and Drew helped me pick out a leash/collar color that we were going to go with (dark brown). Filling out the paperwork took what felt like over an hour. 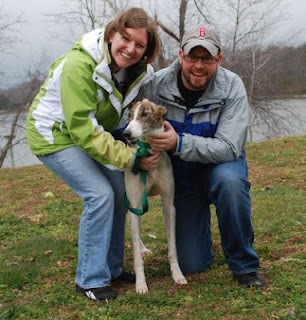 With many distractions and an extremely detailed guide, we were WELL learned about adopting a Greyhound. Before we were finished with the paperwork, I looked at my watch and realized it was already past 2, which meant that the trip to DC (which we'd decided since the weather was mostly nasty and cold) was probably a flop, which meant that Drew would be disappointed. FINALLY, we finished with the paperwork and went downstairs to take a family photo with the new doggie.... at which point we learned that our dog had been taken by the foster family already... disorganized much? I was a little irritated by that point, but we made do and used the "twin" for the adoption photo. Other than size, you really couldn't tell the difference in the dogs. If you read Can I Decide Another Day regularly, you've seen the re-name drama that went down and I'll just spoil the fun for those of you who don't and tell you that Pals Spotlight was an AWFUL name. Everyone had been calling him Spotlight at GHC, so I thought that's what he went by so Drew and I came up with a list of S names, which we decided on Spock. Then we learned that the foster mom was calling him Pals because he seemed to respond to that best. So Drew and I had to start from scratch on the name game and this time it had to start with a P. Pixel and Phil were the 2 big contenders, and I couldn't take myself seriously calling an 80lb male dog Pixel (I tried it for about 20 minutes the day I picked him up), so Phil it is. When we got to the car, Drew was pretty disappointed about the lack of DC trip, he really does love that place. Seriously. We ate the most delightful pizza roll ups on the drive back home like starving children. Since the adoption had taken up lunchtime and well past, we were famished and grouchy. We headed home since there wasn't really anything we wanted to do in town and there was no time/light to do anything photography wise. We'd been home for a while chillin and I looked out the window and promptly said shrieked, "IT'S SNOWINGGGGGGGGGG!!!!!!!!!!!!!!!!!!!!!!!!!!!!!!!!!!!!!!" Since Drew is Mr. I Love Florida, I made him go outside to take pictures in the snow together! He stopped to put on his coat, pansy. I was really more afraid it would stop snowing before we got to take any photos, so I didn't dare stop for a jacket. I'm serious business, yall. Drew, not so much. Drew's probably thinking: It's cold and I only came out her to make her stop shrieking. She's so loud in such a small space. She really LOVES snow. And together now... That's Drew's excited face... obviously. The rest of the evening consisted of being lazy and eating chili for dinner and watching movies and doing last minute-going-out-of-town-tomorrow type things. We drive to VA and spend a few days looking at old stuff AND we FINALLY get to take pictures!